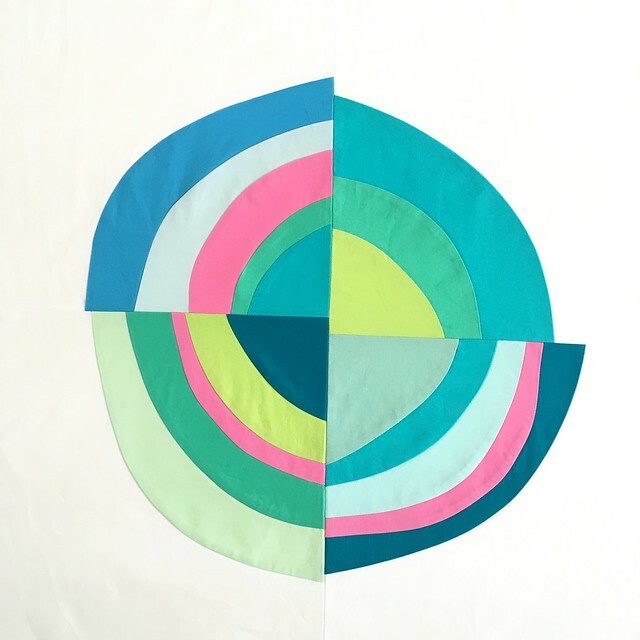 The Q3 Finishes link will stay open from now thru October 7, 2016 - link up your finishes early and if you have a last minute one, add that one later so you don't miss out. The prizes will be awarded as soon as we can verify all the entries and do the drawings. We will post the winners on each hosts' blog. I'm looking forward to seeing all of your finishes. I have some this quarter too, I will be sharing them this week. 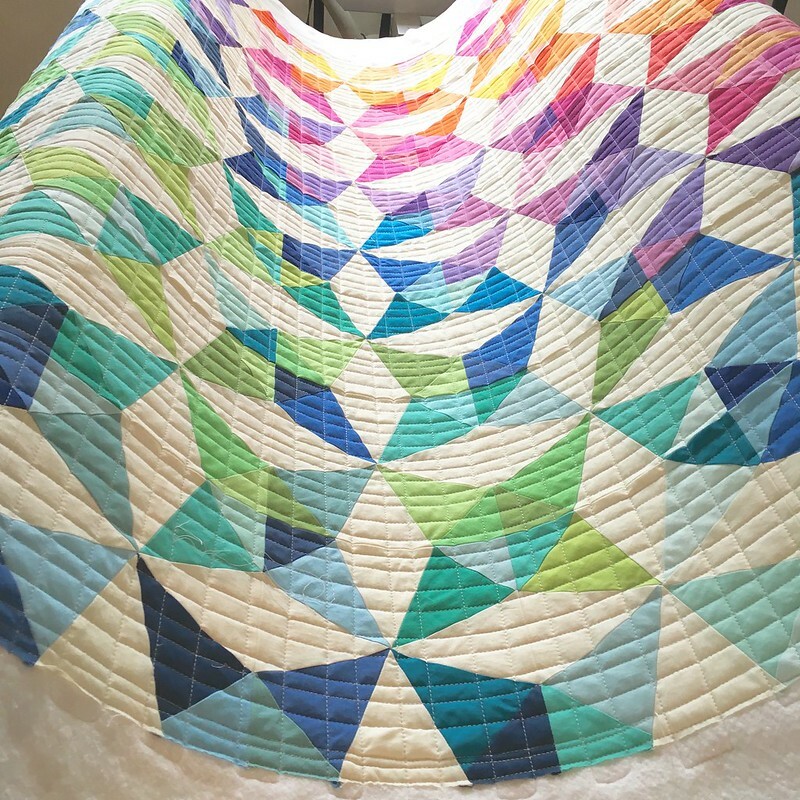 First, I am going to share a bit of the behind the scenes from making Rainbow Breeze, the quilt using the Fat Quarter Shop Summer Breeze Pattern that I shared last week. 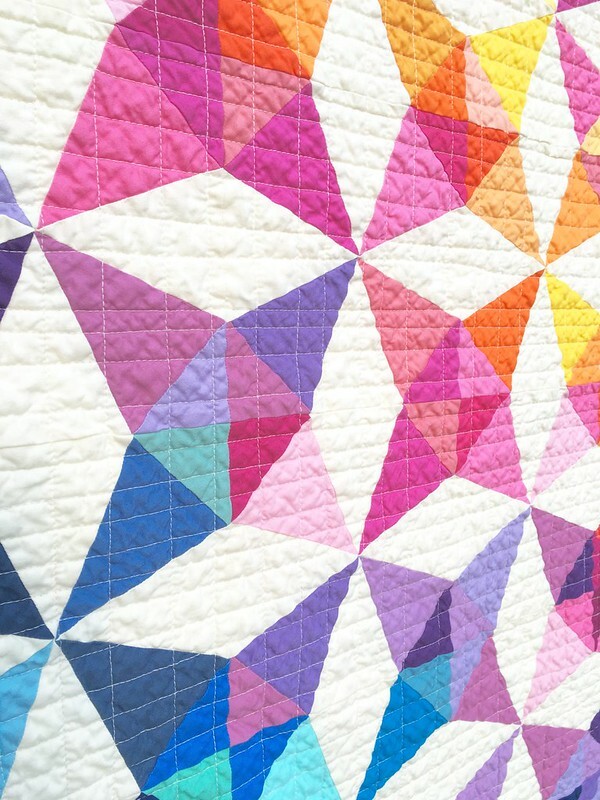 If you watch the short video, you will see that the instructions for the quilt create a lot of scraps. 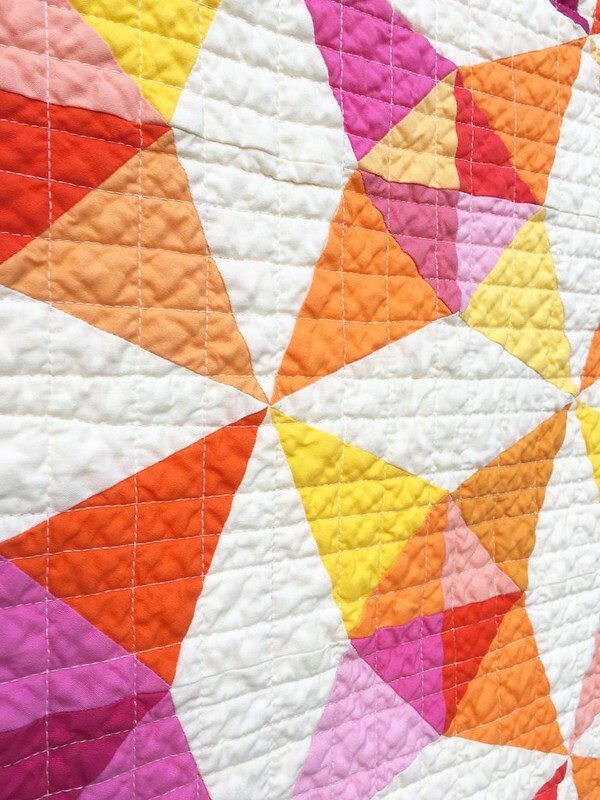 This pattern's clever approach to the traditional kaleidoscope pattern also is designed to use fat quarters. 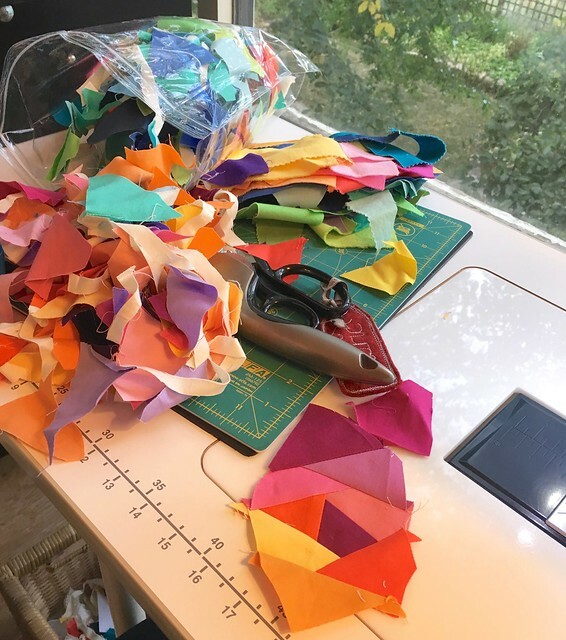 Following the cutting instructions will mean you use up the entire fat quarter of each piece with the exception of a left over strip of about 2". 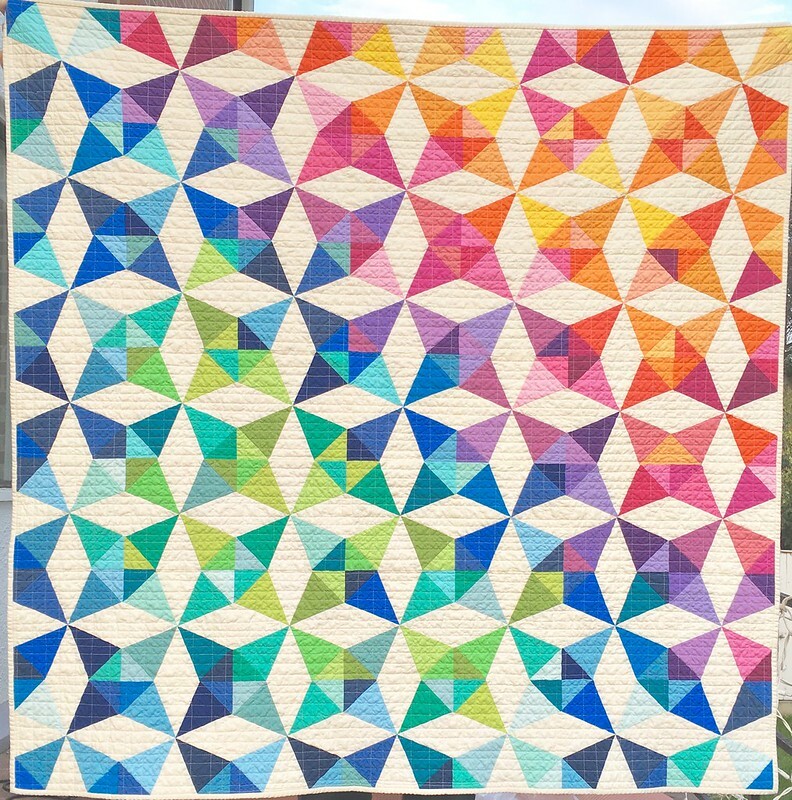 When you cut the triangles from the pieced strips, the pattern does not encourage you to cut two extra triangles in the spaces. But there is more than sufficient fabric to do that, so that is what I did. I figured that out by measuring the first cut and when that seemed fine, I made the first cuts and it worked out, so I carried on. You can see those left over triangles in the background. I have been playing with them and soon will figure out a way to use them. 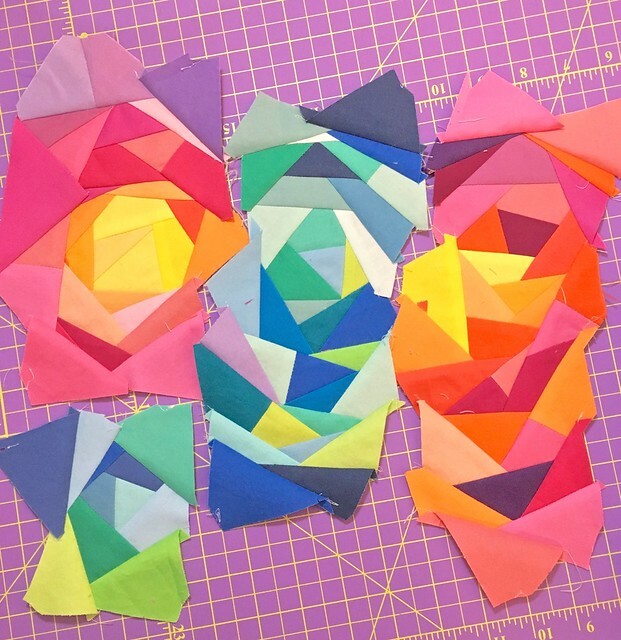 Since I really do not enjoy cutting all the fabric for a quilt before I get started, knowing that I would have all these left over useful triangles for another quilt make it so much easier. 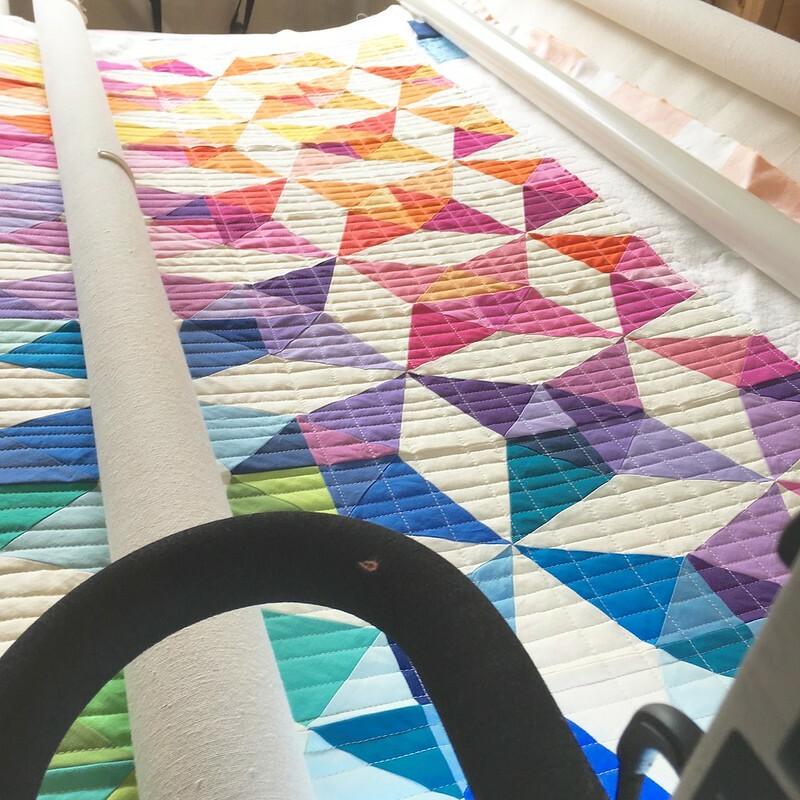 The pattern uses a single block which you trim with the 8.5" ruler. 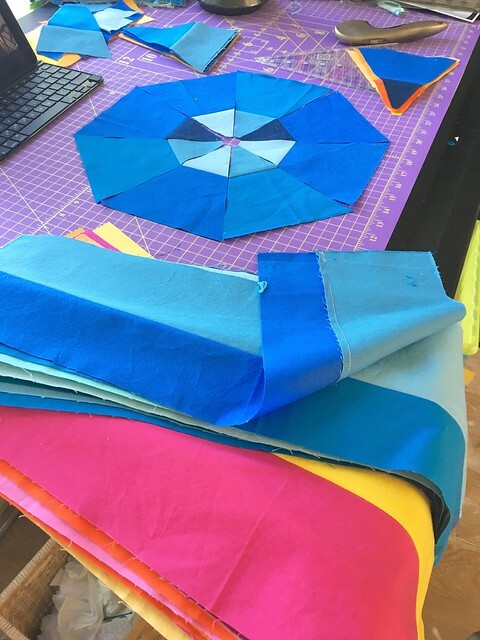 This makes the blocks less fussy than the method I used for my last kaleidoscope quilt but it also means that you have a lot of little scrappy bits. After consulting all of you, I decided to keep those little bits so I have been playing with them. They come together, for me, as sort of stretched out rosettes. 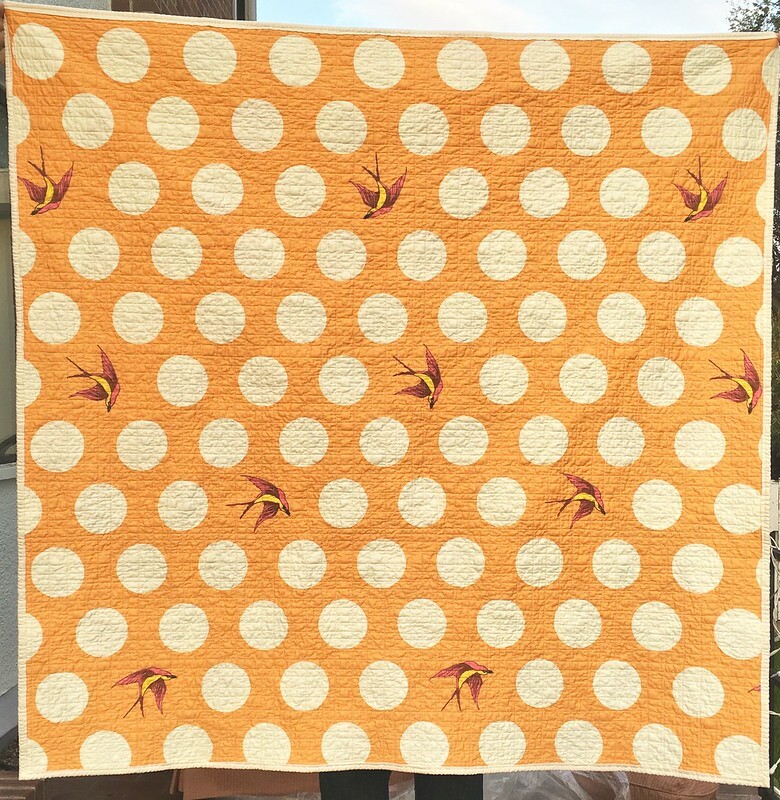 I lowered my ironing board and pieced, trimmed, and ironed as I went. Now I just need to decide how to use these. 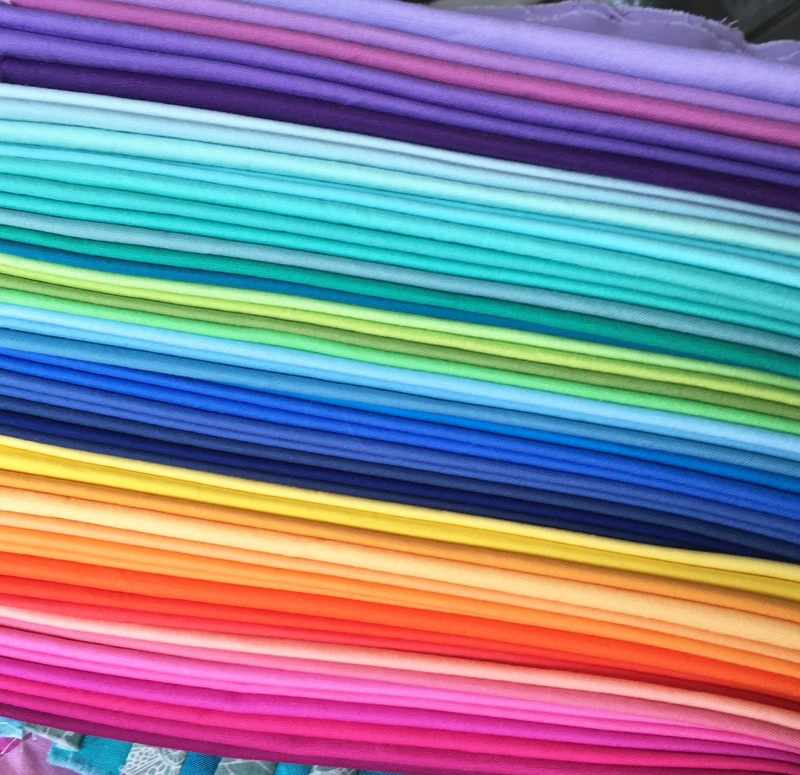 With some background or mushed together or maybe strung along into a long row or a border? 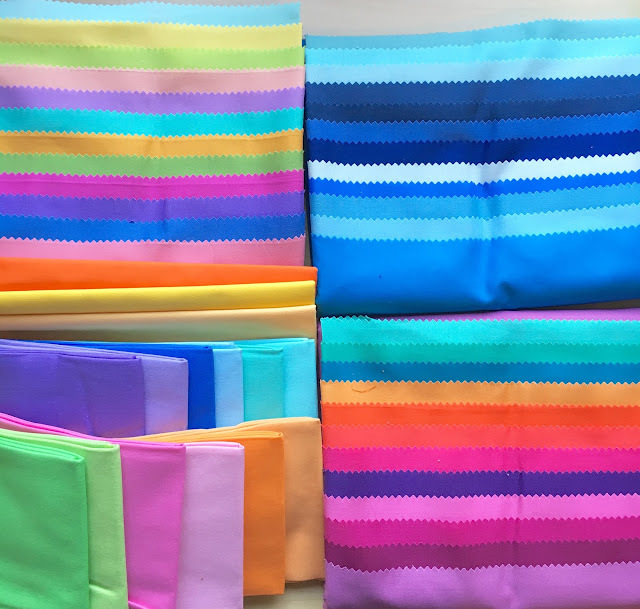 Then, for a quilt or maybe just a pillow? 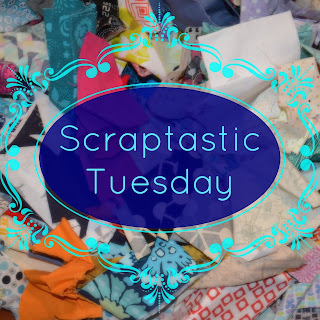 I have to say that these little scraps are fun to play with for a while and then I get tired of them. 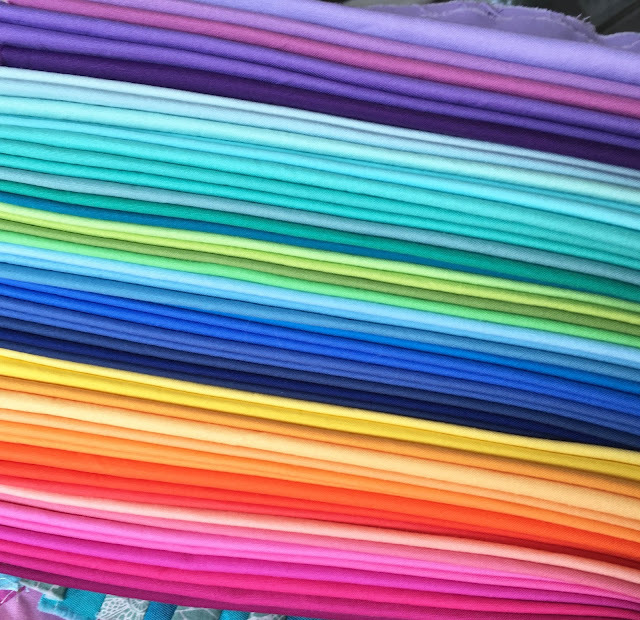 So I am keeping them handy for a sort of leader or ender type project, or when I just have a few minutes to sew. By the way, if you have not been following Nicky's 2016 Scraptastic Sampler, you should. I am hoping to make one too, I love all the stars.